Today we celebrate the 130th anniversary of the consecration of our blue, black and white flag. The occasion was marked by a morning flag ceremony in the Governor’s Garden in Toompea. The President of the Riigikogu Eiki Nestor gave a speech emphasising that the blue, black and white flag unites the Estonian nation from generation to generation. “I am particularly happy to talk today about the students of Põltsamaa Coeducational Gymnasium and Sindi Gymnasium who are carrying on the spirit of the Estonian Students’ Society which gave us our flag 130 years ago,” Eiki Nestor said. 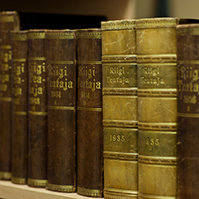 The President of the Riigikogu gave three hand held flags to the Estonian Flag Association, Põltsamaa Coeducational Gymnasium, and Sindi Gymnasium. 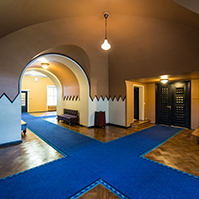 The Estonian Flag Association received the gift on their 10th anniversary for having treasured the traditions surrounding the flag; Põltsamaa Coeducational Gymnasium received it for developing the flag manufacturing tradition; and Sindi Gymnasium for their exceptionally devoted promotion of the flag culture. An address was given on the occasion by the President of the Estonian Flag Association Trivimi Velliste. “We are a free nation and often disagree with each other as free people do. But we all have something in common. Our flag is the common denominator. Moreover, the flag also ties us to those who have already departed, as well as with those who are only born today,” Velliste said. He added that in little over three and a half years we will celebrate the 100th anniversary of our country here in Toompea and across the country. “Today, our tricolour obliges us to think about the people whom we are indebted to – first and foremost the founders of the Republic of Estonia,” said Trivimi Velliste. The flags were consecrated by Archbishop Andres Põder of the Estonian Evangelical Lutheran Church. Members of the Defence League, Women’s Voluntary Defence Organisation, Young Eagles, Home Daughters, Scouts, and Guides stood guard; numerous associations and societies took part with their own flags. 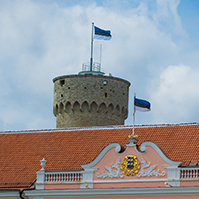 In honour of the anniversary today, the national flag was hoisted to the top of Tall Hermann tower by representatives of the Estonian Flag Association. 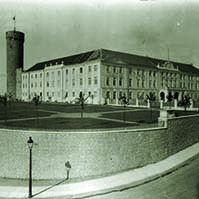 The orchestra of the Defence Forces played and the male and female choir of the Estonian Academy of Sciences sang at the ceremony at the foot of the tower. 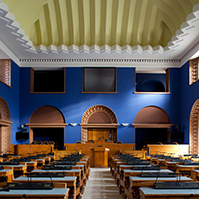 The ceremony was attended by President of the Republic Toomas Hendrik Ilves, President Arnold Rüütel, Prime Minister Taavi Rõivas, members of the Riigikogu and the Government, and leaders of constitutional institutions. 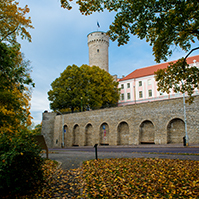 On the National Flag Day, June 4, everyone can visit the Tall Hermann tower; the entrance is from the Governor’s Garden and it is open until 3 p.m. There is an exhibition and an information tent at the entrance, with the Estonian Flag Association along with flag manufacturers explaining the rules for using the flag. The Association is talking about its 10 years of activity and the flag makers are presenting their products. Everyone who visited the tower will receive a small flag as a gift. The Estonian Flag Association invites everyone to hoist our national flag in the morning of this memorial day. Events are organised across Estonia to honour the national flag on that day. The event at Toompea was organised by the Riigikogu and the Estonian Flag Association.